Another Caldecott winner! Another book that made me go, hunh? I get it. Don’t let the damn pigeon drive the bus. Why are we asking kids to watch over a bus? Why can’t the pigeon drive it? Has the pigeon driven it before and done crazy things in this bus? If so, THAT’s the book I want to read. I want to read the “Oh, God! 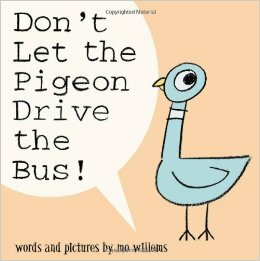 I let the pigeon drive my bus!” book. What exactly did this poor pigeon do to not be able to drive the bus? And isn’t he just the mischievous little thing? “I’ll pay you $5.” “I bet your mom would let me.” Yes, please tell my kids how to get away with doing stuff they’re not supposed to. Because they’re not already doing stupid stuff on their own. But serious. What the hell did this pigeon do that this bus driver from 1952 does NOT want that pigeon anywhere near that bus. But damn that pigeon wants on that bus. He’s like Satan in the garden of evil tempting Adam and Eve with the apple to get on that bus. And it won a Caldecott. What are the requirements to win this award again? This entry was posted in book review and tagged book reveiw, caldecott winner, children's, don't let the pigeon drive the bus, mo willems. Bookmark the permalink.